This instrument, a veena, makes appearances throughout the book, the Toss of a Lemon. and a short discussion of the growth out of the caste system since India's birth as an independent nation based on the books I read in preparation for this blog. Twice born refers to the sacrament of initiation undergone by members of the Brahmins, Kshatriya and Vaishayas regarded as a second or spiritual birth. Male caste members wear a sacred thread loop, next to the skin over the left shoulder and across the right hip. In the book, The Toss of a Lemon, this ceremony is called a "poonal" and signified that a boy was ready to begin learning. This is how it is described: On an auspicious day, at an auspicious hour, seven little boys gather shivering before dawn, oiled and clean, in new silk dhotis and shoulder cloths.....They are told, by the wise and kindly priest heading the morning's events, that this is the day of their birth. Anyone can be born from a mother, he tells them, but what sets us apart as Brahmins is this second birth into caste, into knowledge. Each boy huddles beneath a cloth with his parents, who reveal to him the prayer with which, each daybreak, he will petition the sun for illumination. He is given the three intertwined poonal threads that will signal to the world his special status: his right and obligation to knowledge, his right and obligation to poverty (except, not really). 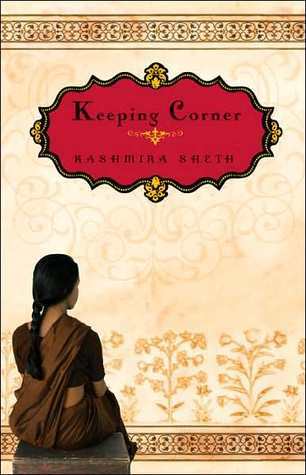 Keeping Corner describes the life of a young virgin espoused to a local boy who is tragically killed shortly before the time they are to become a couple. She is required to "keep corner" which entails remaining in a certain section of her parents home for the course of one year. Her beautiful glass bangles that were given to her by family members in celebration of her "married" state must be broken and she is not allowed to wear jewelry again. Through the course of both these books, progress is made by some of the main characters in regards to adherence to new values that improve their lives while others choose to cling to prejudices and destructive values and traditions. This is not to label all traditions as "destructive". Not in the least. It was clear that the origins of many Indian traditions did have value or at least did at the time they were constructed. However, in the case of the widow traditions it is difficult to find value. Fortunately, in Keeping Corner, young Leela is not willing to throw her life away to widowhood and embraces Gandhi's doctrines and progressiveness. But sadly, Sivakami of The Toss of a Lemon starts her life progressive because of the influence of her husband but changes little afterward except when pressed by her family. Sivakami finds that her son, Vairum, is disgusted with her lack of adaptation to the new culture growing in India creating a chasm between the two. Vairum represents the new Indian who is class-tolerant, eating with members of lower castes and eschewing castes while Sivakami clings to the traditions of the old India. Much like real life, members of her family fall at about all points in-between, some more willing to accept change, others less. The book offered an excellent look at the evolution of Indian culture. the book Sivakami's oldest son faces the prospect of marriage. He refuses to be bound by convention and chooses his own wife much to the chagrin of Sivakami. In Keeping Corner, Leela's marriage was arranged from a very early age. She approves of her bridegroom, but has friends who find the tradition stifling. took place between races during Partition. As mentioned earlier, Jaffrey and her family embraced other cultures (and their foods). Almost overnight, their friendship was rebuffed by Muslims fighting for Partition - they had become the enemy even though they never endorsed either side of the issue. I found her account of this historical occasion enlightening and reconfirming of what is so often true, there rarely is a "good side" or "bad side" in any conflict. Throughout my reading with a focus on castes, I have found that same thought to be true. The caste system overall was brutal to so many, particularly women, but even so it did provide a sense of order and community that appears to be lost today. Does that justify the harm it did (does)? Not in the least! But it is worth mentioning in the hope that the said community will be one day restored in a healthy way creating a more unified India. *I will pay a visit to John Steinbeck's books circa 1932-1937.